CARAMEL APPLES!!!! I remember ALWAYS wanting one whenever we passed a Rocky Mountain Chocolate Factory, but they were always so expensive. I finally tasted one during my senior trip in college, and there was no going back. Shortly after, I spied them at Safeway and decided it was time to try making them myself. It was a delicious but messy affair, and I had to call Ben in to help me out. It wasn’t very pretty that first year. The caramel gooped on the bottom so there was an uneven ratio of sweets:apple, but you know what? They were SO GOOD! We made four apples that year, and it was such a treat every time we sliced one open. Thus began an autumn tradition in our home. We’ve made it every year since, and our methods have gotten a little better each time. We’ve experimented with different apples, tried disposable chopsticks instead of popsicle sticks, used various toppings (chopped almonds > sliced almonds, IMHO), and used different methods to keep the caramel from pooling at the bottom. Our method is still not perfect, but we’ve come a long way! There are some tips I’d like to offer that should make for a smoother apple-coating adventure. When it comes down to it, this is a very simple concept: stick popsicle sticks into apples, dip them into melted caramel, and coat with toppings. Except that… simple doesn’t always mean easy. 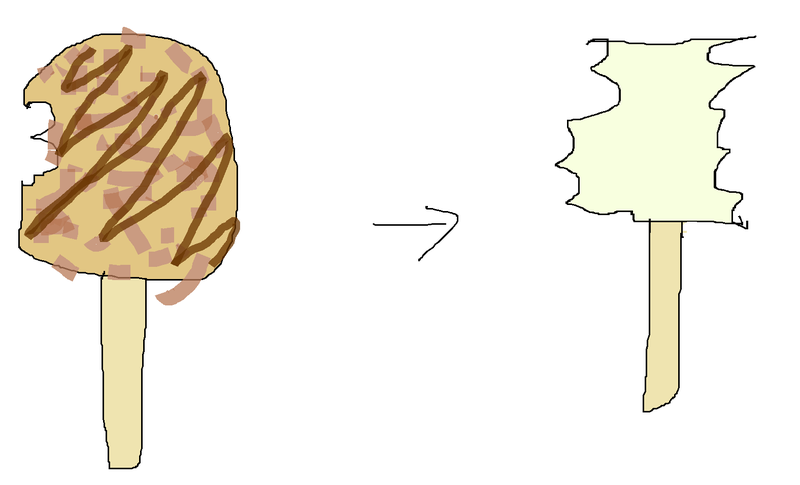 I mean, the idea is easy enough, but there’s a reason why caramel apples are always a two-person job in our household. I always require Ben’s help to make them or I’ll end up with a crazy sticky mess and sub-par caramel apples! 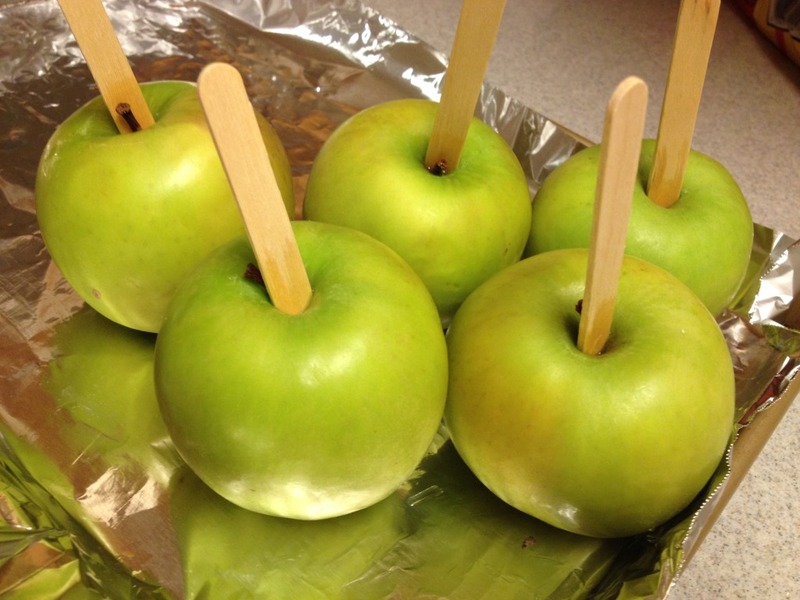 After years of making these, I’ve come up with a recipe that will help first-time apple-dippers successfully make beautiful, delicious caramel apples! Challenge #1: Your caramel doesn’t stick to the apple. You dip it, set it down, and over the next 10 minutes, gravity pulls your caramel down and it pools in a goopy mess at the bottom of your apple. You will have an uneven apple-to-caramel ratio once it’s time to eat! Solution #1: Dip your shiny store-bought apples in boiling water for about 5 seconds to melt the wax coating, and then immediately polish off the softened wax with a paper towel. 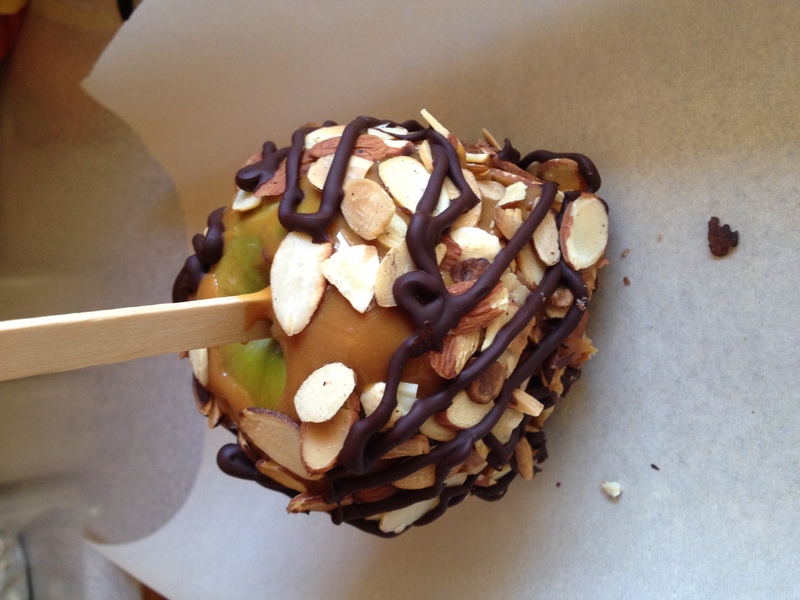 Now that your apples are matte instead of glossy, it should help keep the caramel from sliding down as much. Solution #2: Additionally, freeze your apples for about 45 minutes before it’s time to dip them in the caramel. Make sure you put the stick in and wipe off the wax first, if you’re taking that step. This will help the caramel harden onto the apple rather than ooze down the sides while setting. Challenge #2: Your caramel gets hard too quickly and the extra toppings don’t stick. You are left with a plain caramel apple. Wah-wah. Solution: Use a smaller Pyrex to heat up your caramel in– taller and narrower than a wide bowl or pot– and work quickly to dip the apple in the caramel and then mash it into the nuts. 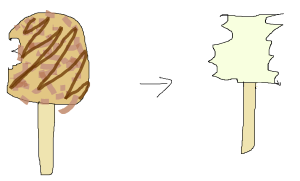 Tilt the bowl toward you when turning the apple in the bowl to help it coat more quickly (see image below). If you are a slow poke, your caramel will harden and begin drying in a matter of seconds, and the nuts will not stick. This is the only step where you have to rush. Once you’ve got the nuts on there, you can put it down and come back to it later to drizzle with chocolate. Like that action shot in the third photo? That’s cuz I was mashing them so fast Ben couldn’t get a clear shot. That’s how quickly you have to work with the caramel! Also, having someone help you tip the bowl and scrap off excess caramel is handy! Ben and I always make these together– I’d never try it myself. It would be too messy and frustrating! 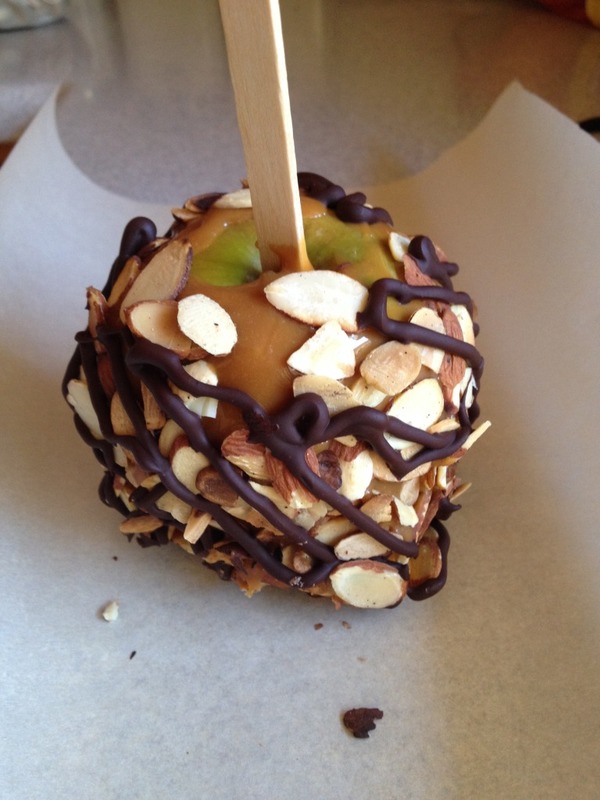 Challenge #3: Uneven distribution of sweets:apple: You bite into your apple and enjoy the outer layer– packed with chocolate, caramel, nuts, and some apple… but after eating all the outsides, you’re left with just a tart apple core. Sadface. Solution: Use an apple corer to remove the core, and then slice into wedges to serve. 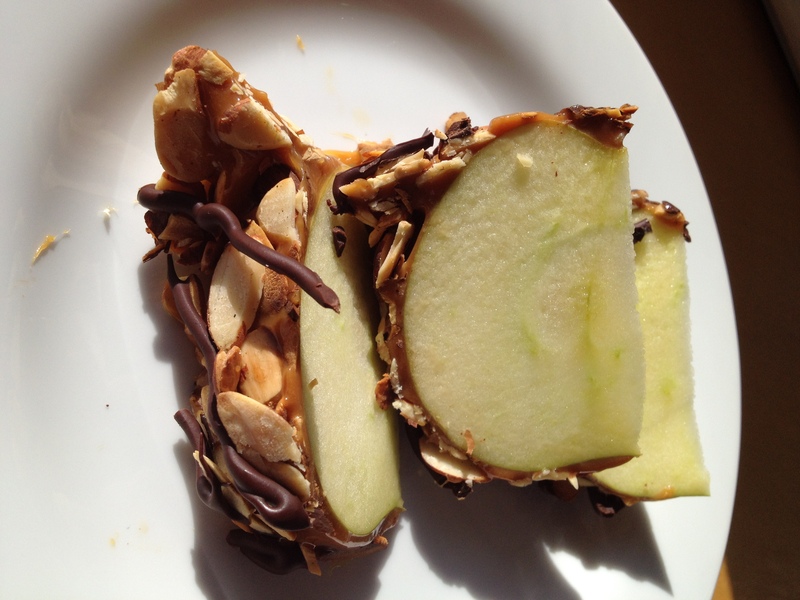 Each wedge will have the perfect ratio and balance of toppings and tart apple. 4. It’s messy. That’s why this is a family tradition :). This is definitely a two person job for us, with Ben rotating the apple like a rotisserie spit and me drizzling the chocolate. I used to use a fork to drizzle, which works fine, but nowadays I use a disposable piping bag, which is even easier and makes for a prettier result. 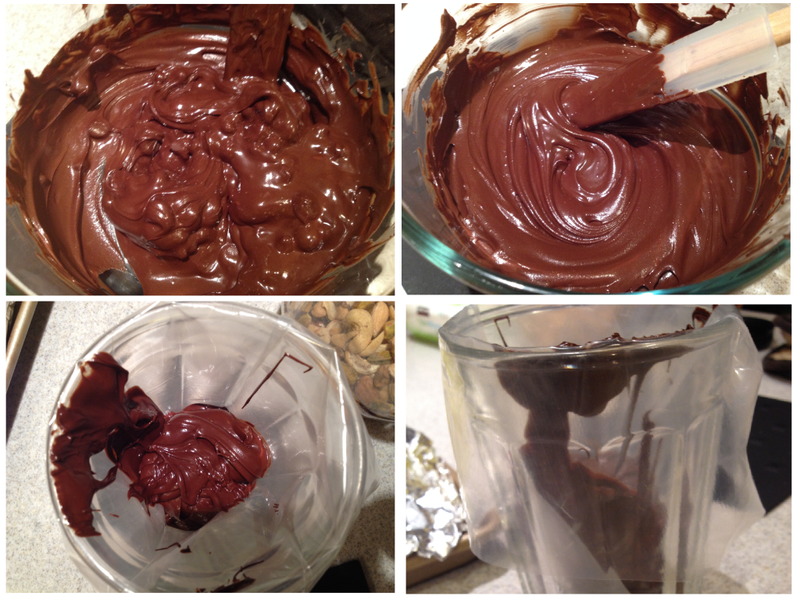 Melt your chocolate in a Pyrex, and spoon into a piping bag. I like to use a tumbler to hold up my piping bag until I’m ready to use it, then I snip off a small hole on the bottom when I’m ready to drizzle chocolate. Here’s another tip: Have all your ingredients ready ahead of time! I know all good cooks are supposed to do the mise en place thing, but this is extra important when it comes to making caramel apples. Chop your chocolate beforehand. Toast the nuts and place them in the bowl beforehand. Butter your foil ahead of time (so your caramel apples won’t stick to it later). Place your chocolate chips into a microwave safe bowl. Get e’erthang ready. You will thank yourself later. If your caramel seems chunky after microwaving, keep stirring and it should eventually get smooth. Same with the chocolate. We like Granny Smith apples because the tartness contrasts well with the sweet caramel and toppings. I’m pretty sure it’s still apple season, so get your Granny Smiths soon and have a caramel apple-making party! Each family member can customize their own apple and share it later with everyone else. It’s a delicious way to welcome autumn! Get everything ready: Insert a craft stick firmly through the middle of each apple. Butter a sheet of foil so your caramel apples won’t stick later. Place the toasted nuts into a wide mouthed bowl. Place your chocolate chips into a microwave safe bowl, ready to nuke. (Optional but recommended:) Remove waxy layer on apples: Fill a small saucepan with enough water to cover an apple. Bring it to a boil. Once it’s boiling, hold the apple by the stick and submerge it in the water for about 5-8 seconds, and then vigorously wipe off the melted wax with a paper towel. Repeat with remaining apples. (Optional but recommended:) Place apples into the freezer for about 45 minutes to chill. 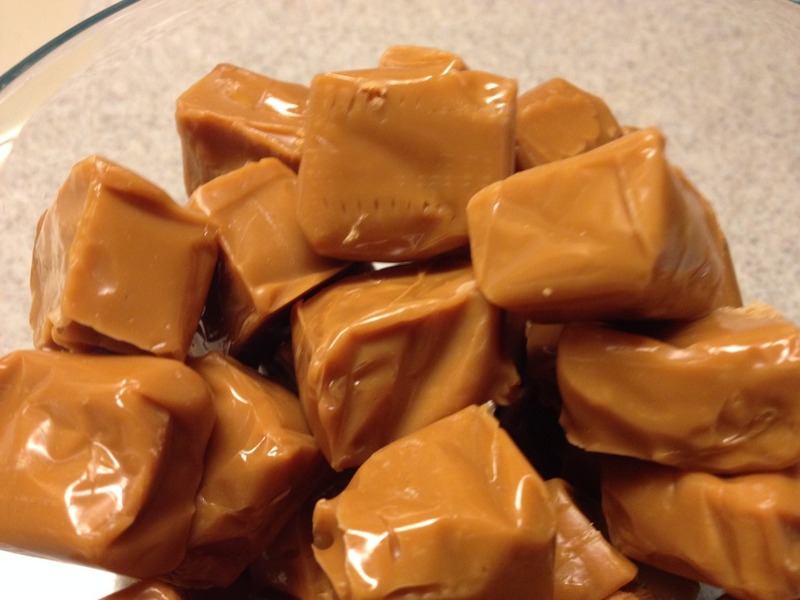 Melt caramel: Place caramels and milk into a 4-cup Pyrex. Microwave at 50% power for 2.5 minutes, then use a fork to stir until the caramel is smooth. Dip apples: Working quickly, dip the apples into the caramel and spin so that there is an even layer all around. It may help to tip the bowl toward you while turning the apple. Quickly scrape off excess caramel with your fork and immediately push the caramel surfaces of the apple into the nuts, coating every sticky surface. Place on oiled foil and repeat with remaining apples. Drizzle with chocolate: Once all the apples are dipped and coated with nuts, melt the chocolate in a microwave-safe bowl: microwave for 1 minute, then use a fork to stir until it is smooth and glossy. If it’s not becoming smooth and glossy, then microwave an additional 30 seconds and stir until it is smooth and glossy. Repeat as needed (shouldn’t be more than 1.5 minutes total though). 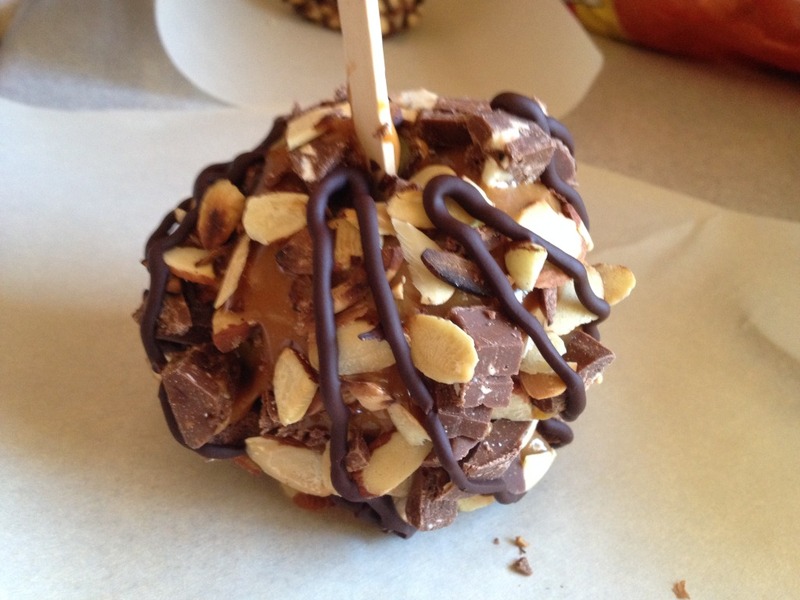 Then use your fork to drizzle melted chocolate over each caramel apple. 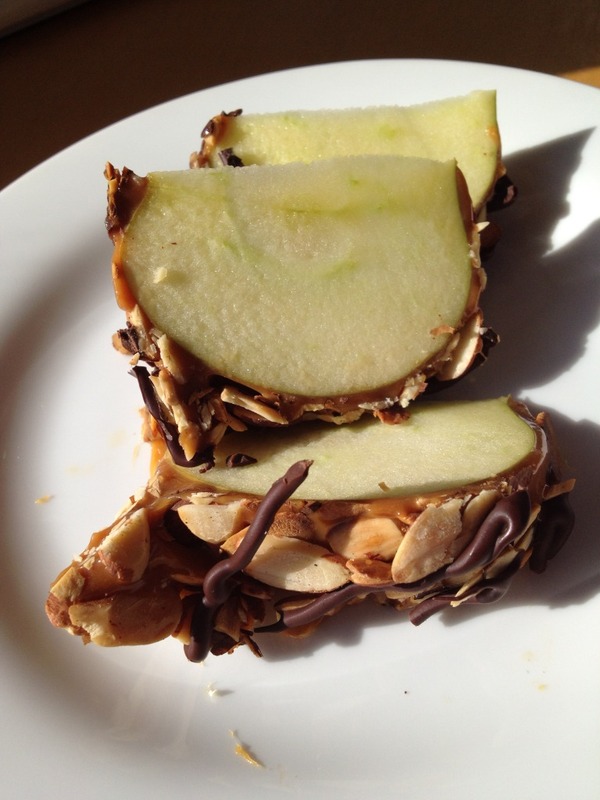 Set apples onto oiled foil and place in refrigerator to set. To serve, use an apple corer to remove the core, then slice in even wedges to serve. 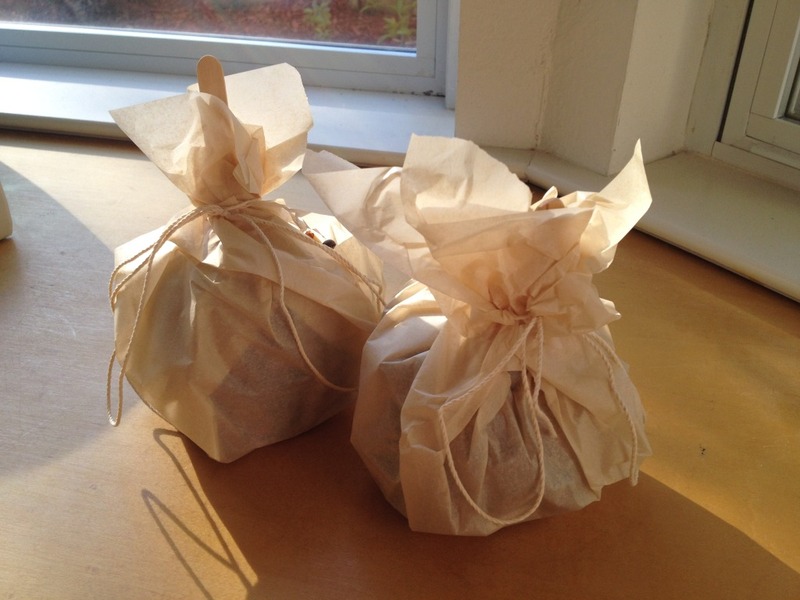 To gift, wrap up each apple in a big square of parchment paper, twist paper around the stick and tie with string. I still remember how clumpy my caramel apples turned out, even with you teaching me. XD I’ll make sure to try again this year by myself! Hopefully, it turns out okay! I still have your apples in my fridge :] Hope your caramel apples turn out well! =D When we made them, I don’t think we froze them first, so hopefully that helps!